Tami Paisley is proof positive of the power of partnerships. 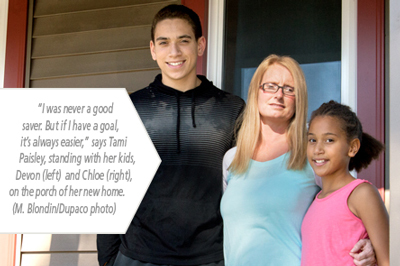 Thanks to a collaborative effort between Dupaco Community Credit Union and local nonprofit organizations, the single mother of two has traded her cramped apartment for the first home she’s ever owned. “It feels good. I appreciate everything the city and Dupaco have done to get me here. I’m so happy here,” Paisley says. Paisley, 38, is the latest successful participant of Dupaco MoneyMatch—the savings account that matches your effort. It’s an Individual Development Account in which the savings of a participant are matched by a grant from the Dupaco R.W. Hoefer Foundation or the Iowa Credit Union Foundation. The savings and matching funds are used to purchase a specific wealth-building asset. Paisley used MoneyMatch to help purchase a three-bedroom home in downtown Dubuque earlier this year. But it’s not just any home. It’s a symbol of the strength of community partnerships. Paisley’s property was renovated through the Housing Education and Rehabilitation Training program. HEART, which receives financial support from Dupaco, aims to teach at-risk high school students trade skills through community-revitalization projects. Thanks to those behind HEART, the oncerundown house looks brand-new, boasting a beautiful front porch, new siding, hardwood floors, a kitchen island and “the coolest chandelier”— breathing new life into not only the home but the neighborhood as well, Paisley says. Paisley’s only regret is that she didn’t access these community-driven programs sooner. She had been struggling to scrape together a down payment on a home when she turned to MoneyMatch in 2014. The program forced her to systematically save, an empowering experience that showed her homeownership was possible after all.